Winter always calls for the colour Red. Whether it is for Christmas combined with green, New Years combined with gold or silver or Valentines red should be included in your colour palette. It symbolises strength and love whether you want to show that you are independent or in love. LiuLiveEat suggests to include a red lip colour and a red nail polish in your collection this season! Clothes constantly changes but you can keep the same colour of your lip and nails for days,weeks or months. Red is also a very sharp colour so to include in your outfit constantly so if you wear it in clothes it might be overpowering. Photo credit official website of OPI. The reason why I use OPI is because the colour as shown on the bottle is the same as when it shows on the nails with only one or two coats. The colour also is very durable unlike other nail polish brands. And of course the unique names for the nail polish is a plus! 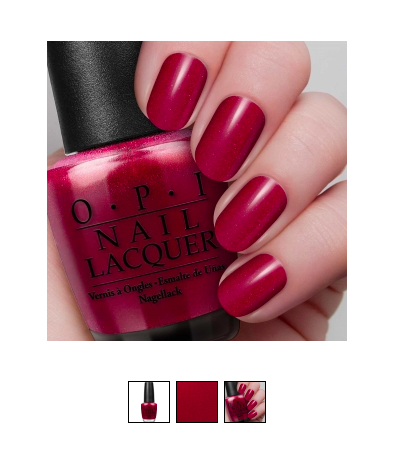 This red has a little shimmer to it for special events and parties you will be attending! If you prefer a solid colour you can try the Thrill of Brazil one. Photo credit official website of MAC. If you are going to put on a red lipstick you better use a lip liner to make the colour look clean on your lips! Since it is such an eye catching and bold colour you want to make sure you do it right. Furthermore it can also make your lips look fuller for all of you who always dreamed of having full lips. This colour matches exactly to my third item so get it together if you are going to purchase this colour. Photo credit official website of MAC. This shade of red compliments with the Brick Lipliner from MAC. It is a very eye catching yet soothing red. I use it during special occasions and sometimes casually. It fits perfectly with this weather and season! Yes, it’s very nice! I love how solid the colour comes out! That OPI color is beautiful!! Have a great start to the week gem!